Want to know what trends are coming out of Europe? 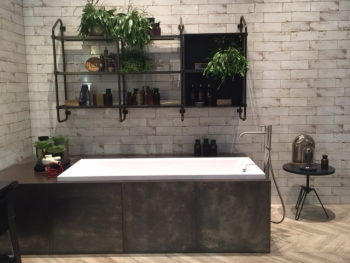 Greenfield Cabinetry sales representative, Karla Krengel of Krengel and Hood LLC, based out of Chicago, Ill. shares her inspirations from a recent EuroCucina trip to Milan, Italy. 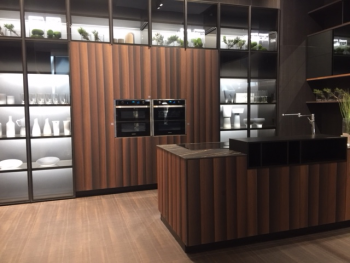 We bring you part two of EuroCucina Inspirations. It has been said 10 of the 15 top design brands come from Italy. So, it is no surprise 435,063 design types from 188 different countries converged on Milan, Italy recently to attend Salone del Mobile. 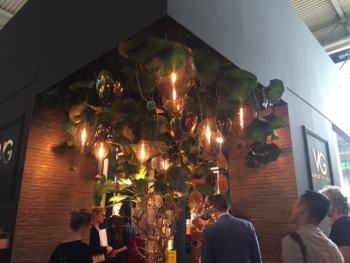 Salone del Mobile brings the design world together to discover what is new in styles, trends, design offerings – and it is where said design types go to be inspired. Every other year during this fair, as the local Milanese call it, there is EuroCucina. 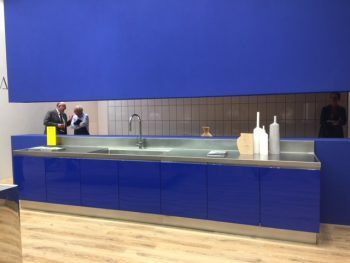 EuroCucina is the kitchen specific part of the fair. “Metal, metal everywhere! The word ‘champagne’ was used a lot to explain a gorgeous toned down version of rose gold we saw often in Milan,” according to Karla. Like what you see below? Check out Greenfield’s Aris and Cubist metal frame doors, as well as our 3 stainless door options here. 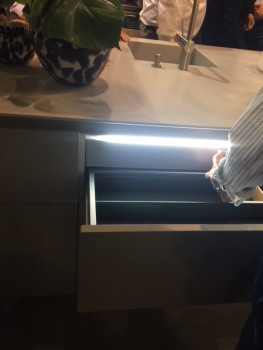 “In fact, the overhead lights were left off at EuroCucina (at our American kitchen & bath shows they shine brightly) and it added to the impact the lighting had on us,” she observes. Like what you see below? 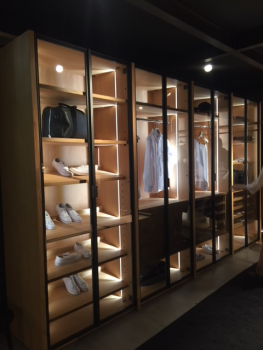 Explore our Storage section and ask your authorized designer about our lighting program. Like what you see below? 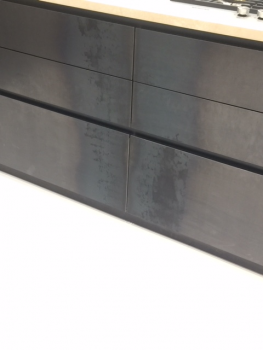 Check out Greenfield’s Estridge and Farmington door styles. 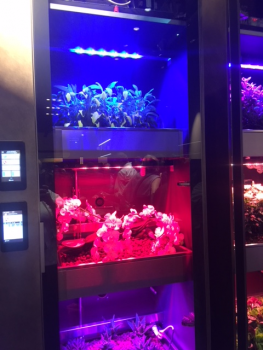 Grow Your Own: “Imagine a new appliance for your kitchen about the size of a tower/column freezer, with individual growing pods, allowing for specific environmental needs for every plant, from your basil to your favorite flower. From humidity level to watering, each pod is individually controlled,” says Karla. 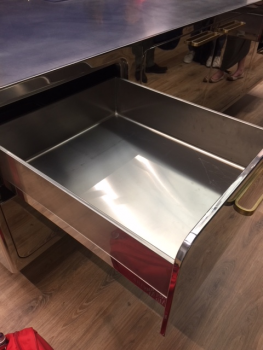 Induction Countertops: “We knew this would happen…we just weren’t sure when. It’s here; we saw it with our own eyes! 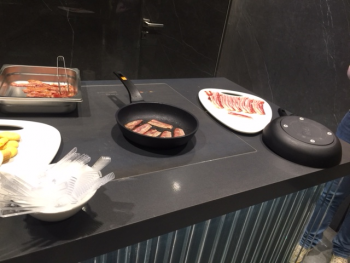 A porcelain countertop company is now delivering their countertops with the induction cooktops already installed into the countertop! It is a gorgeous, seamless look – and, these are available in the U.S,” she notes. Interested in technology in the kitchen? 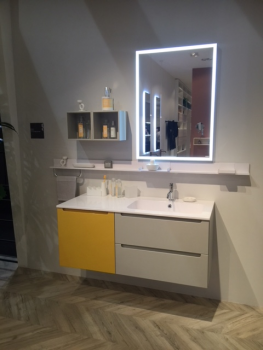 Ask your authorized designer about Servo-drive cabinets, and our popular charging drawer option. 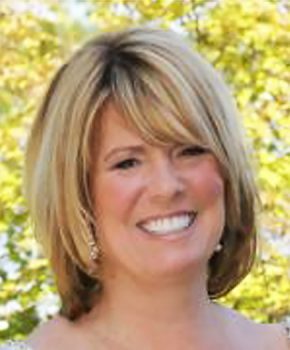 Karla Krengel is an independent representative of The Corsi Group for Illinois, Minnesota, Wisconsin, North Dakota, and South Dakota. To learn more about EuroCucina, click here. Photography courtesy of Krengel and Hood LLC. Thanks, Karla!